The Poppies were denied an opportunity to take over at the summit of the Evo-Stik League South Premier Division after their midweek home clash with Coalville Town was postponed due to the wintry conditions at Latimer Park. It means Marcus Law’s team head to the West Midlands to take on the leaders trailing them by a point with two games in hand. Frontman O’Connor hit the only goal of the game as Kettering beat Royston Town 1-0 last weekend while Stourbridge suffered a surprise 2-1 loss at Hitchin Town. And he fully expects there to be more twists and turns regardless of what happens in the biggest game of the season so far tomorrow (Saturday). “I think you’d have to say it’s a two-horse race and it is certainly swinging one way and then the other at the moment,” O’Connor said. 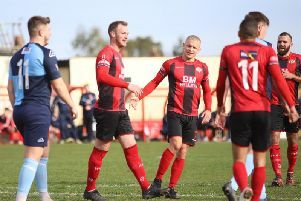 “Everyone was up in arms when we lost (to Biggleswade Town) last Tuesday but then we won at the weekend and Stourbridge lost and everyone on our side is happy again. “I am sure it is going to be like that and I am sure things we change two or three times at least before the end of the season. O’Connor believes there will be more pressure on Stourbridge than Kettering when the top two collide tomorrow. And he firmly believes the Poppies won’t be going there just to “sit back”. “I think the pressure is largely more on them than us, especially after the results last weekend,” he added. “I think we can go into it a bit more relaxed and that’s when we are at our best. “The way we play, we aren’t a team to sit back and allow pressure to be piled on us.